Communication is much more than what we say; it is also how we say it. With subtle variations in your voice and body language, the same words can carry significantly different messages and will affect how your message is remembered. As a leader, you are constantly communicating with the people around you so it is important to be aware of the presence you are projecting, especially in stressful situations. In his presentation of Powerful Communication Techniques at the recent PMI Leadership Institute Meeting, Mario Busjra, PMP, referred to Harvard Business Professor Amy Cuddy’s TED talk “Your Body Language Shapes Who You Are” where she offers her free, two-minute life hack. By simply changing your posture for two minutes, you can affect your chances for success. In a fascinating study, she and her colleagues asked people to assume a high power pose or a low power pose for two minutes prior to a stressful job interview. They video taped the interviews and the non-partial judges consistently picked the high power posers as the people they wanted to hire. It was all about the presence they projected. In addition, the people who assumed the high power poses had higher levels of testosterone and lower levels of cortisol than before they assumed those poses. Therefore, they felt more confident and less stressed after holding one of the high power poses for only two minutes. Before an interview, presentation or an important meeting where you will be evaluated by what you project, warm up by assuming one of these power poses in private. Once you are feeling more confident and less stressed, it is important to tone it down a bit in public. You want to come across as confident, not domineering. If you make this a habit, it will become natural and eventually you will become the confident, powerful person you are projecting. I’m glad you liked the photo! 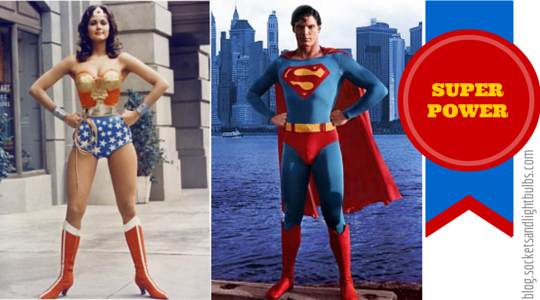 The high power pose is called The Wonder Woman, but I thought I should be fair to both men and women and put Superman in the photo. The pose is the same 🙂 And since I work in the super hero world, I can validate that there is a Superwoman and Batgirl. They just aren’t as well known.